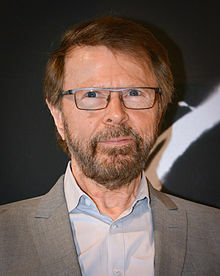 Björn Kristian Ulvaeus (credited as Björn Ulvæus Swedish pronunciation: [bjœːɳ ɵlˈveːɵs]; born 25 April 1945) is a Swedish songwriter, producer, a former member of the Swedish musical group ABBA (1972–1982), and co-composer of the musicals Chess, Kristina från Duvemåla, and Mamma Mia!. He co-produced the movie Mamma Mia! with fellow ABBA member and close friend Benny Andersson. This page was last changed on 9 March 2018, at 22:58.